Jenny and I arrived at a pub this afternoon for a nice quiet lunch only to discover smoke billowing from the engine of my car. My first reaction was "engine fire!" but it eventually turned out to be on oil leak. The oil was burning when it dripped on the muffler. 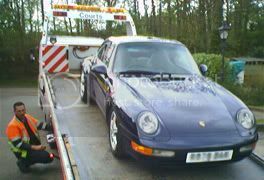 In fact with the engine running, oil would gush out and a 993 has a lot of oil! I'm sorry to say it got all over the pub car park. Luckily the breakdown service didn't take long to come but they quickly gave up and called for a recovery truck. I spent the rest of the day at a garage while they tried to diagnose it. It's not the oil filter or any of the sensors. The current theory is that an engine seal has blown which is quite unusual. It's still at the garage and chances are it's gong to be a non-trivial repair. Groan! The car is still at the garage. They've had to back order an engine part from Germany. Meanwhile, I'm going to have to rent a car. Ugghh. Final bill was £270 (including parts and labour) and £74 for a 3 day car rental. Ouch!